Wendy Lamb Books, 9780385737012, 160pp. Fourth-grader Calvin lives near the beach in Oahu with his mom and little sister. Mom says: “You’re the man of the house.” But Calvin’s not great at being the man of the house, or taking care of his responsibilities. He’s too busy having fun with his pals, and avoiding Tito, the bully. 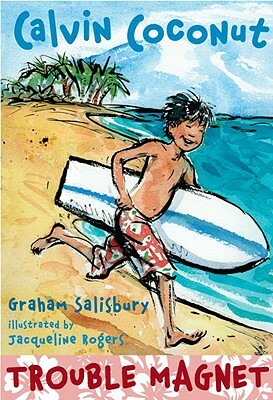 Trouble Magnet is the first book in a new series for younger readers full of all the fun of growing up in Hawaii. It introduces a wonderful multicultural cast of characters, including Mr. Purdy, who calls his fourth-grade class Boot Camp; Uncle Scoop, who runs the lunch wagon at the beach; Ledward, Mom’s 6'7" boyfriend; and gorgeous, intimidating, 15-year-old Stella-from-Texas, who arrives to be the live-in babysitter—and to step all over Calvin’s turf. Graham Salisbury is the author of several award-winning novels. His most recent book is "Night of the Howling Dogs." He lives in Portland, Oregon. Jacqueline Rogers has illustrated more than 90 books for young readers over the past 20 years. She studied illustration at the Rhode Island School of Design. She lives in Chatham, New York.